You can’t always plan for when you will need dental care. If an emergency arises outside of your regularly-scheduled checkups and cleanings, know you can count on Dr. Crowley and the team at Bluff Creek Dental to provide urgent dental care. Call us as soon as possible and we’ll schedule a time for you to come in, and have you back to smiling again in no time. Cleanliness – rinse out your mouth and rinse off any dislodged pieces of tooth or dental restoration. Use cool water and be gentle. Don’t rub, scrub, or use oral hygiene products unless directed to do so. Cold – cold compresses will help you to prevent swelling, relieve pain, and slow the flow of blood. You should apply an ice pack for 20 minutes at a time (20 on and 20 off). 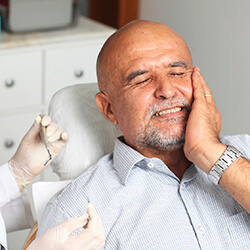 Pain relief – take over the counter pain relievers as necessary to reduce discomfort, but don’t place an aspirin directly onto the tooth as this can damage soft tissue. Damaged teeth – if all or part of a tooth is broken, retrieve the tooth, dental restoration, or broken pieces. If possible, replace your knocked out tooth or restoration in the vacated socked. If not, keep the tooth or restoration pieces safe until you reach our office. Storing teeth in a container of milk or water is the best way to protect them and ensure the greates chances for successful restoration. While you can’t always prevent dental emergencies, taking the time to brush and floss each day, visiting our office twice a year for checkups, and using protective mouthguards during sports events are great ways to reduce your risk for dental emergency. We invite patients in Oklahoma City, Edmond, Deer Creek, Yukon, Mustang, Moore, Norman, and Midwest City to count on us for emergency dentistry services! If you have broken a bone or experience heavy bleeding that does not slow or stop after 10 minutes of consistent pressure, head straight to the emergency room. We’ll be happy to work with you and other medical professionals to ensure you receive the care you need to get the smile back on your face.